Simnel Cakes were originally made by servants and maids as gifts for their mothers when they returned home for what was usually their one holiday, Mothering Sunday. During these mid-Victorian times, the cakes would be decorated with flowers. 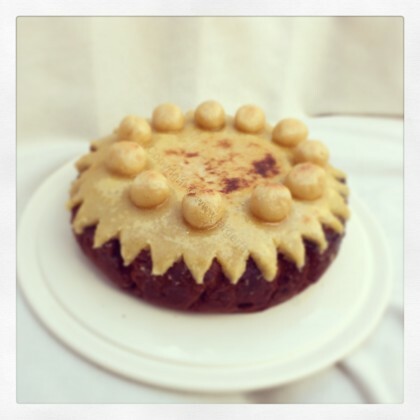 The light fruit Simnel Cake which is now eaten during the Easter period contains two layers of marzipan or almond paste, and instead of the flowers eleven marzipan balls are placed on top of the cake, symbolising each of the disciples – apart from Judas, that is. This recipe makes one nine inch cake. First make the almond paste by mixing together the ground almonds and sugar, and gradually adding the eggs until you have formed a light, pliable dough. Set aside. Begin making the cake by creaming the butter and sugar together until light and fluffy. Keep mixing as you gradually add eggs to the mixture. Add in the sifted flour a tablespoon at a time, then add the spices. Mix until thoroughly combined. Add the mixed fruit, cherries, peel and zest. Stir in thoroughly. Grease a 9″ baking tin. Add half the cake mixture to the tin and smooth. Separate the almond paste into thirds. Roll one third out to approximately 5mm thick and cut a disc large enough to fit snugly in the tin. Place on top of the cake mixture. Add a second layer of cake mixture on top of the marzipan. Smooth the top over and bake in oven for approximately 2¼ hours. Check during baking – if it’s getting too dark before the inside is cooked cover with a layer of foil. Your cake is baked when a knife inserted into the centre comes out clean. When fully baked remove from oven and allow to cool within the tin for ten minutes, before removing from tin and setting on a wire rack to cool completely. Once cake is completely cooled, melt the apricot jam and spread across the top. Roll out another third of the marzipan and place on top of the cake, allowing a little to hang over the edges. Feel free to give the marzipan a decorative edge! Divide your final third of marzipan into 11 and roll each piece into a ball. Place on the top of the cake. Place the cake under a hot grill in order to toast and brown the top of the marzipan. Watch carefully as it won’t take long before browning becomes burning, and you don’t want that! Now enjoy it with a nice cup of well deserved tea!